Hong Kong Chief Executive C.Y. Leung says the protests "have gone out of control"
Hong Kong (CNN) -- Hong Kong's embattled chief executive has said the city's pro-democracy movement is "out of hand" and being influenced by "external forces" from outside the city. In a television interview with a local station that aired Sunday, C.Y. Leung said the protests, which have lasted more than three weeks, have "gone out of control even for the people who started it, for people who planned it, for people (who) scripted it." Without identifying any particular group or individuals, Leung said this was not "entirely a domestic movement" and that there was "obviously participation by people, organizations from outside of Hong Kong, in politics in Hong Kong, over a long time. This is not the only time when they do it, and this is not an exception either." READ: End of trust in police? "My personal connection with foreign countries would be: South Korean cellphone, U.S. computer, Japanese Gundam action figures. All of which were of course, made in China." Leung was speaking in the wake of further clashes over the weekend between protesters and police in the city's Mong Kok district after the authorities attempted to reopen roads in the area to traffic. Protesters crossed police lines, authorities said, clashing with officers as the situation turned violent. At least 240 people were injured, according to the Hong Kong Hospital Authority, which manages all public hospitals in the city. Eighteen police officers were injured, Hong Kong police said. Violence erupted after police conducted a dawn raid Friday on a student protest camp in the commercial and residential area of Kowloon. Authorities then moved to clear a major intersection occupied by the pro-democracy movement, tearing down tents and dismantling barricades. What can come out of Hong Kong talks? 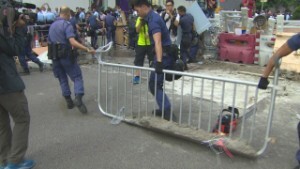 Around 500 to 600 police carrying wire cutters and riot shields stormed the site, a smaller offshoot of the main downtown protest area, catching the 100 to 200 protesters by surprise. Secretary for Security Lai Tung-kwok called protesters in Mong Kok "radical," saying they were not protesting peacefully but instead carrying out violent acts and violating public order. The city's deputy leader, Chief Secretary Carrie Lam, said Saturday that televised talks with pro-democracy protesters would take place on Tuesday, with Lingnan University President Leonard Cheng, a former adviser of Leung, as moderator. READ: Who is C.Y. Leung? This news received a lukewarm from Yvonne Leung, spokeswoman for the Hong Kong Federation of Students, who said the protest group didn't "have much opinion" about the details of the meeting. 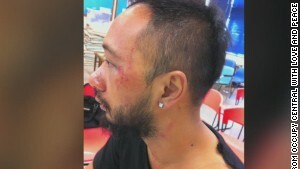 Political commentator Frank Ching told CNN Monday that the talks are unlikely to produce results because the Hong Kong government is not in a position to meet the demands of the protesters. "They can't agree to overthrow the August 31 decision [by China's National People's Congress]. I don't think that C.Y. Leung will resign. What is in their authority to do is to open up Civic Square, where the protesters used to be. The protesters want that to be opened up to the public." Ching was referring to China's insistence that any candidate nominated for the election of the city's next chief executive in 2017 must come from a shortlist approved by a largely pro-Beijing committee. Leung has repeatedly said Beijing will not retract its decision. Currently, the chief executive is elected by a specially-appointed 1,200-member election committee. Protesters are demanding the freedom to vote for a candidate of their choice and the immediate resignation of Leung. Meanwhile, police said at least 33 people were arrested following the weekend clashes and now face various charges, including property damage, disorderly conduct, weapons possession and resisting arrest. On Sunday, a 23-year-old protest leader was arrested for posting messages on an online forum encouraging people to join an unlawful assembly and charge at police, as authorities warned against using the Internet to incite "unlawful" Occupy protests. The protests have been characterized by the use of social media and technology to organize and mobilize support for a campaign of "civil disobedience." Armed with smartphones utilizing super-fast mobile networks, Hong Kong's young protesters have been able to deploy in large numbers at a moment's notice. CNN's Elizabeth Joseph, Katie Hunt, Anjali Tsui, Pamela Boykoff and Esther Pang contributed to this report.